Animated STAR TREK - "One of Our Planets Is Missing"
The Enterprise encounters a cloud creature that feeds on the energy of the planets that lie in its path. Spock mind melds with the entity and tells it that it is killing life and he persuades it to return to its place of origin. PSA epilogue for "One of Our Planets Is Missing"
This episode's writer, Marc Daniels, was also a prolific television director. He directed fourteen episodes of the Original STAR TREK series. Marc Daniels died in 1989 after a long and successful career in films, television and theatre. This episode was similar to the original series episode "The Doomsday Machine" (which was directed by Marc Daniels) in that a huge planet-eating hazard threatened inhabitable worlds until stopped by Kirk and his crew. In this episode we learned that Commodore Wesley retired from Starfleet to become the governor of Mantilles, a planet with a population of 82 million. We also learned that he had an eleven-year-old daughter. 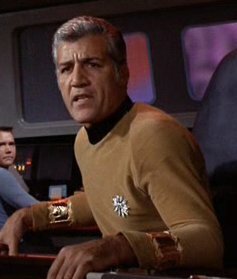 Commodore Robert Wesley was first seen in the original series episode "The Ultimate Computer" and was portrayed by Barry Russo (pictured). 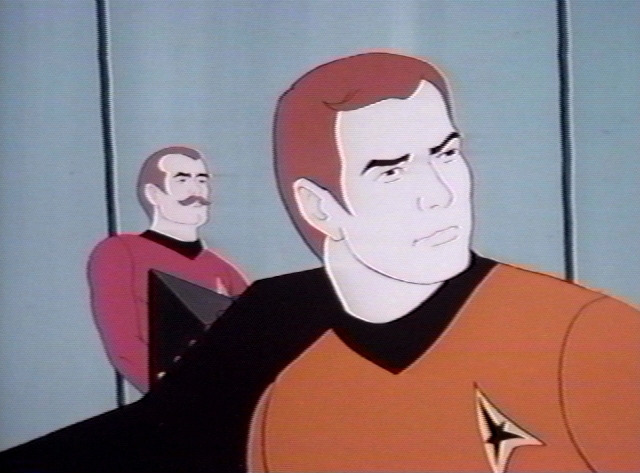 The animated Robert Wesley was voiced by James Doohan. 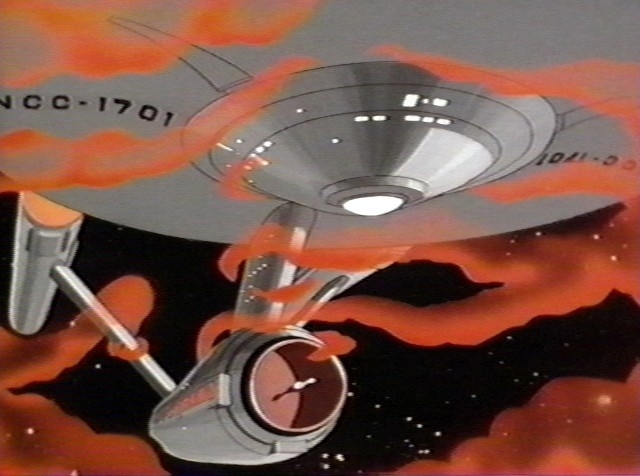 This episode marked the first appearance of U.S.S. Enterprise navigator Lieutenant Arex as voiced by James Doohan. Arex had three arms and three legs and he came aboard in 2269, replacing Ensign Chekov who departed the ship at that time. In this episode's climactic scenes, when the cloud creature threatened the populated planet of Mantilles, Kirk ordered that the ship's self destruct system be armed, and he was prepared to blow up the ship to destroy the cloud's "brain." The self detruct system was used in several original series episodes. 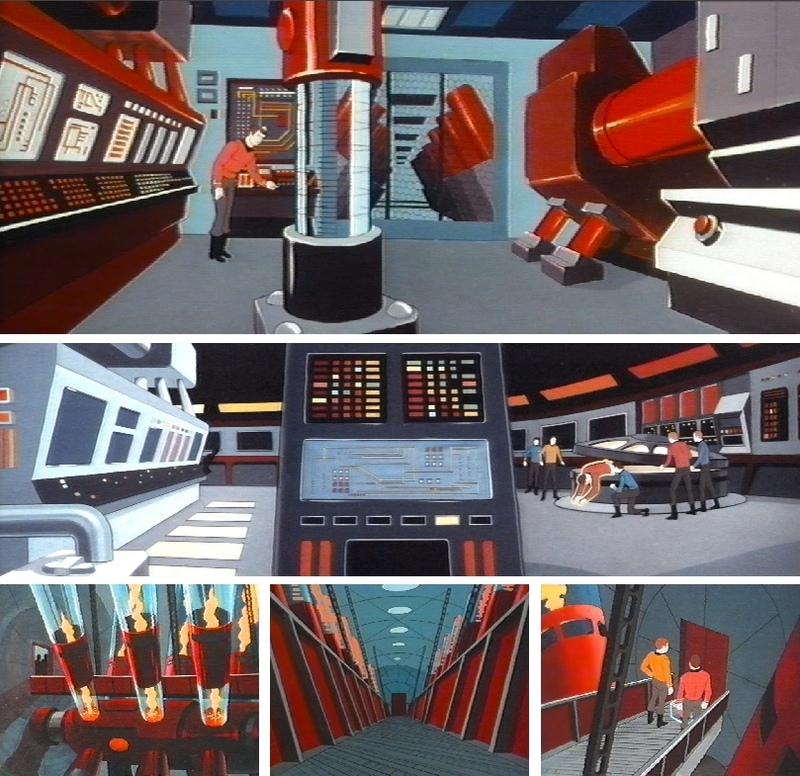 Key scenes of this episode take place in Scotty's engineering section. The huge expanse of the matter/anti-matter control room and main engineering with it's core hatch were much more elaborate than was seen in the live action series. In this episode's dialog, Kirk refers to having once said "Today I will not kill." Kirk uttered those words in the original series episode "A Taste of Armaggeddon." As in several episodes of the original series and the movies, the Vulcan mind meld proves too useful a capability to be without when Spock uses it in this episode to save 82 million people. The mind meld was also seen in "The Infinite Vulcan." Stock footage/cels from Lassie's Rescue Rangers, another 1973 Filmation TV show, was used in this episode. Views of Earth on a computer screen were shown to Spock as he was melding with the cloud intelligence. It was these scenes that featured children running with a dog that came from the Lassie show. Transporter Chief Kyle appeared in this episode but he had no dialogue. This episode's story was similar to several other Trek tales such as the original series episode "Immunity Syndrome" and the STAR TREK: Voyager episodes "The Cloud" and "Bliss." "One of Our Planets Is Missing" was novelized by Alan Dean Foster in Star Trek Log One published by Ballantine Books in June 1974. Also novelized in the book was "Yesteryear" and "Beyond the Farthest Star".